DELAYS in releasing new timetables this month have been described as ‘not acceptable’ by the Office of Rail and Road, while watchdog Transport Focus has called a special meeting of its board on 15 May to quiz senior industry representatives about the disruptive effect of engineering work. The failure to publish new timetables in time to meet the industry’s 12-week booking ‘window’, meant that some passengers could not plan their journeys with any certainty. In February, Network Rail said it was not able to finalise this spring’s timetables until six rather than the normal 12 weeks in advance, and the ORR wrote to operators then to emphasise that they would have to make sure that passengers continued to receive the best information available. The ORR said it has been talking to operators and seen some improvements, such as better signposting of late notice changes, but ‘there is still much more that needs to be done to help passengers’. Meanwhile Transport Focus is also taking the industry to task over insufficient warnings for passengers when engineering works affect their travel plans. When the watchdog meets on 15 May, it will ask senior industry representatives to explain what is being done to warn passengers more effectively, and also how quickly recent problems will be sorted out. Transport Focus chief executive Anthony Smith said: “The timetable on some parts of the railway just can’t be relied on. 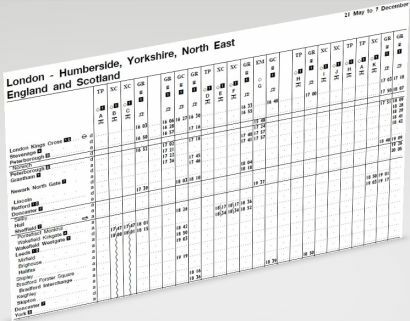 The rail industry must do more to warn passengers about inaccurate timetables so they can plan their journeys. Transport Focus is monitoring whether the rail industry is meeting its temporary six-week target to confirm timetable changes. It said this follows an investigation in December which highlighted ‘serious failures’ to meet the 12-week target. Stephanie Tobyn, who is the ORR’s deputy director, consumers said: “ORR’s monitoring has shown that train companies are not always giving passengers good enough information to help them plan their journey.